This beautiful stone cottage is close to the village of Boscastle near to Tintagel and can sleep four people in two bedrooms. 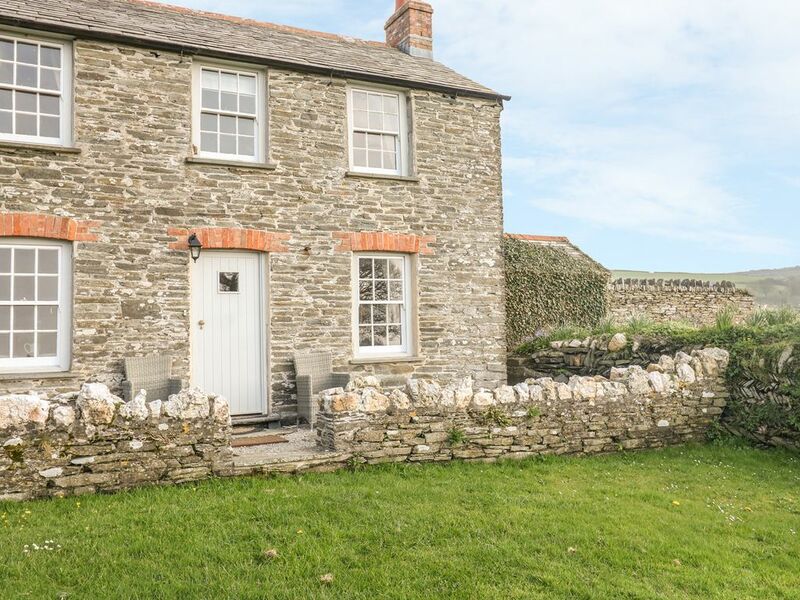 Home Farm Cottage is a lovely stone cottage situated on a working livestock and arable farm, half a mile from the village of Boscastle and just four miles from Tintagel in Cornwall. The cottage can sleep four people in one double bedroom and one twin together with a first floor bathroom and a ground floor shower room. Also in the cottage is a kitchen, a dining room with woodburner and a sitting room with open fire. Outside is off road parking for two cars and a private lawned garden with patio, furniture and barbecue. Home Farm Cottage is a perfect base from which to explore this beautiful part of the country. Amenities: Oil central heating with woodburner and open fire. Electric oven and hob, microwave, fridge, freezer, washing machine, tumble dryer, dishwasher, WiFi, TV with Freeview, DVD, selection of books, games and DVDs. Fuel, power and starter pack for stove and fire inc. in rent. Bed linen and towels inc. in rent. Off road parking for 2 cars. Lawned garden with patio, furniture and BBQ. Sorry, no pets and no smoking. Shop 8 mins walk, pub 10 mins walk. Town: A perfect Cornish coastal village, the road through Boscastle runs down to the small harbour at the bottom of the hill. The quaint shops, local restaurants and pubs offering good food, Cornish real ales and live entertainment by local musicians, make this an ever popular visitor destination. Spectacular clifftops, rocky coves, wild surf, open fields and rich wildlife characterise this beautiful area. The coastal footpath passes through some of Britains most rugged and spectacular coastal scenery. Two bedrooms: 1 x double, 1 x twin. Bathroom with bath, hand-held shower, basin and WC. Ground floor shower room with shower, basin and WC. Kitchen. Utility. Dining room with woodburner. Sitting room with open fire. Oil central heating with woodburner and open fire. Electric oven and hob, microwave, fridge, freezer, washing machine, tumble dryer, dishwasher, WiFi, TV with Freeview, DVD, selection of books, games and DVDs. Fuel, power and starter pack for stove and fire inc. in rent. Bed linen and towels inc. in rent. Off road parking for 2 cars. Lawned garden with patio, furniture and BBQ. Sorry, no pets and no smoking. Shop 8 mins walk, pub 10 mins walk.